No. 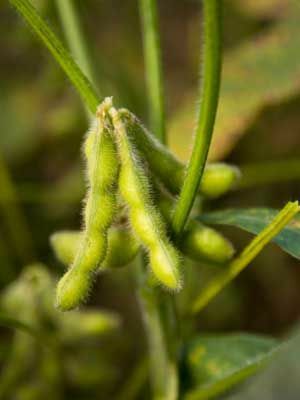 Soybean is a warm-season crop to grow in summer. When using soybeans to improve very poor soil, mixing a balanced organic fertilizer into the soil before planting will give better results. Plant seeds from late spring to early summer. Soybeans must have warm soil to germinate and grow. Poke holes into a cultivated bed or row to plant soybean seeds about 2 inches (5 cm) apart and one-half inch (1 cm) deep. Thin to 6 inches (15 cm) apart in all directions. Soybean cover crops are used primarily to add nitrogen to poor soil. Soybeans are very attractive to deer and Japanese beetles.